Our final chapter in our beginner’s guide to water chemistry covers GH. GH is essentially the hardness of your water. And today, I’m going to teach you everything about it. 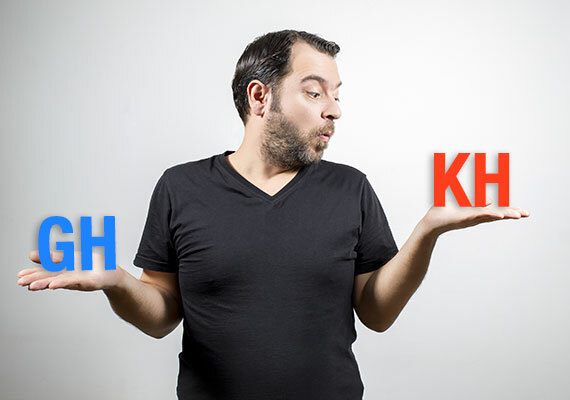 What is the difference between GH and KH? Why is GH important to your aquarium? What is the best GH for your aquarium? How do you test the GH of your aquarium? What happens if your GH is too high? General hardness, also known as water hardness, is referred to as GH for short. It’s basically the measure of the many salts that are dissolved in your water. In particular, calcium and magnesium. Water with a low GH is said to be soft, and water with a high GH is considered hard. So, soft water has very little or no calcium and magnesium. Hard water has a lot. While GH is an important part of water chemistry, most of you using tap water don’t need to worry about it. You see, your GH entirely depends on your water source. Most tap water generally has sufficient GH so that you’ll never have problems with it. If your water source is very soft or very hard, keeping certain types of fish that prefer to live in the middle of this range can be difficult. You’ll need to keep an eye on your GH and raise or lower it accordingly. On the flipside, some fish thrive in hard water such as cichlids, while others thrive in soft water like discus. If you want to keep these fish, you need to monitor your GH. It is also worth mentioning that since saltwater tanks use RO/DI water, they don’t have to worry about GH because the salt mix restores these minerals. Beginners often confuse general hardness (GH) with carbonate hardness (KH). While both have the word hardness in their name, they measure different parameters of your water. General hardness (GH): The measure of magnesium and calcium dissolved in water. Carbonate hardness (KH): The measure of carbonates and bicarbonates dissolved in water. I have really hard water where I live. They are referring to GH. KH, on the other hand, keeps your pH levels stable. In nature, GH and KH go hand in hand. If a waterway has a high GH, it also has a high KH. It’s quite possible for your tap water to have a really high GH and a very low KH. So, just having a high GH does not automatically mean that you also have a high KH. For more information on KH, check out FishLab’s detailed guide. Why is aquarium GH important to your aquarium? The number one reason why you should monitor the GH of your aquarium comes down to one word…Osmoregulation. Osmoregulation is a natural process that your fish do automatically. It’s like you or me breathing, meaning it just happens. To put it super simply, osmoregulation is the process of your fish balancing the salts and water inside their body with the salts and water outside their body. If an imbalance occurs, it can stress your fish or worse. In severe cases, it can lead to the death of your fish. This is why a freshwater fish won’t survive in salt water and vice versa. You’ve probably seen this word in Gatorade advertisements. Electrolytes is just a fancy term for minerals and salts that conduct electricity when dissolved in water – minerals like calcium and magnesium (GH!). Pretty darn important stuff, right? Your fish need electrolytes to remain healthy, and the only place your fish can get them is by drawing them from the water. Water with no GH has no electrolytes for your fish to use! This can lead to some serious health issues. Attention planted tank owners: Even aquatic plants need some degree of electrolytes. For example, plants use calcium to grow. If you have very soft water, then the GH might not be high enough to supply your plants and fish with the electrolytes they need to remain healthy! As you see, it’s pretty important that your aquarium contains at least some level of GH. You should also note that the GH of your aquarium can change over time. GH can become lower in your tank because fish and plants use up the trace minerals. Or, it could be that GH is higher in your tank because calcium and magnesium are left behind when water evaporates from the tank. The ideal GH levels entirely depend on what you stock in your tank. Let’s look at the suggested ranges for different types of aquariums. While the measurements can be listed as part per million (PPM), I prefer to use degrees of general hardness (dGH). One dGH is about equivalent to 17.9 PPM. Please note: The following recommendations are rough guidelines only. Your specific fish, plants and invertebrates may require more precise GH levels outside these ranges. The important thing to remember is that the GH of your aquarium is invisible. You won’t be able to tell the difference between soft water (low GH) and hard water (high GH) just by looking at it. Don’t worry! It’s affordable and easy-to-use. But best of all, a single GH test kit can last for hundreds of tests. Just follow the step-by-step instructions for accurate results. FishLab Note: The results of the test can be given in degrees General Hardness (dGH) or parts per million (PPM). Which you use is a matter of choice. I personally use dGH and refer to it from now on. 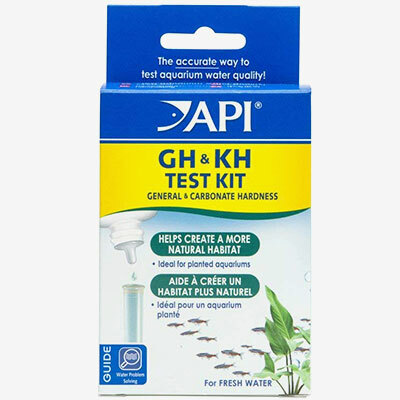 While there are aquarium test strips available that also test for GH, I don’t recommend them. Based on personal experience, test strips are much less accurate than liquid test kits. How often should I test the GH of my aquarium? 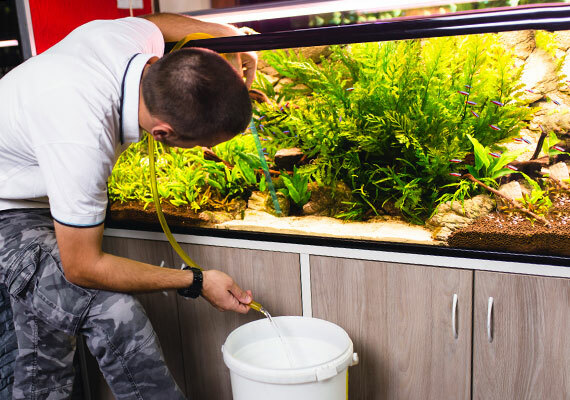 Unless you have very hard or very soft water or want to keep a sensitive species of fish, most of you won’t need to worry about regularly testing your tank for GH. However, if you do, I recommend testing it once every time you perform aquarium maintenance, such as a water change. As I covered earlier, all tanks need some degree of GH. But what happens if the GH of yours is too high? Let’s look closer at three negatives brought on by high GH. Okay, so this point is the matter of some debate. After all, you don’t have to go far to find resources that state a high GH will not affect fish as long as they have acclimated to the hard water. …as long as they have acclimated to the hard water! But what happens if you buy a new fish and your aquarium has a significantly higher GH than that of your local pet store? Well, that’s when things can turn nasty. Generally, when you buy a new fish for your tank, you bring it home, float the bag for about 20 minutes, and then add the fish to your tank, right? You have not given your fish a chance to adjust. Your fish will experience what is called osmotic shock. While it can take a few days, osmotic shock can kill your new fish. Because osmotic shock isn’t an instant killer, beginners often blame the death on the fish being unhealthy rather than their hard water. Drip acclimatization is exactly what it sounds like. You drip water from your current tank into a container with the water your fish came in. By adding your harder (or softer) water drop by drop, your fish will find it much easier to adapt to the change in water hardness. It’s a slow process, but it gives your fish the greatest chance of survival. It’s almost like a gravel vacuum, but instead of streaming a constant flow of water, it removes it drop by drop and really simplifies drip acclimatization. The reason? In their natural habitat, these fish breed during the rainy season. As their homes flood with extra water, the GH drops. The fish use this drop in GH (among other factors) to let them know that it’s time to start getting frisky. So if your GH is too high, then you will have difficulty breeding these sensitive fish. Most plants can tolerate a moderately high GH. However, there are sensitive softwater plants that can be almost impossible to grow in hard water. Chain Sword or Dwarf Sagittarian are two plants that thrive in soft water and struggle when the GH rises. The solution is simple: Select plant species that will happily grow in the GH of your water! Tested your aquarium water and discovered that you need to raise your GH? Let’s look at how you can do exactly that! Is your tap water moderate to very hard? For most of you, that will be all that is needed to increase the hardness of your aquarium water. Simply keeping up with your water changes will be enough to replenish the GH that has been depleted by fish and plants in your tank. But what if you have very soft water? Or maybe, you just want to increase the GH higher than what your tap water currently contains? RO/DI water is very soft water that has been stripped of all its mineral content. It contains zero GH and, on its own, is unsafe for fish and plants. Remineralizer restores the lost minerals. But it’s not just great for RO/DI water, you can use it to raise the GH of soft well water or tap water as well! 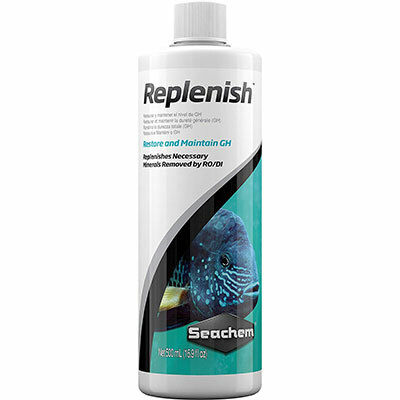 My favorite remineralizer is… Seachem Replenish. By following the included instructions, this remineralizer allows you to reach a specific GH with little effort. 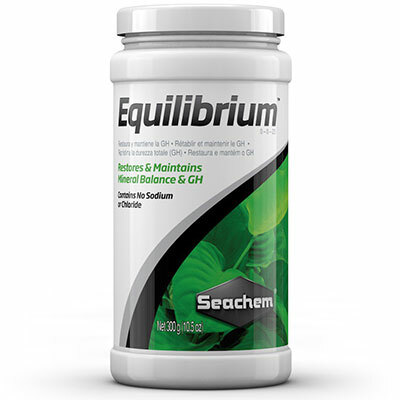 Seachem Replenish contains sodium chloride, so it is not suited for planted tanks or salt-sensitive fish, such as certain breeds of catfish. Free from sodium chloride, it’s perfect for raising the GH in your planted tank. Remineralizer is generally added each time you perform a water change. Wonder shells contain magnesium and calcium. When added to your aquarium, these shells slowly dissolve, releasing these elements into your aquarium and raising your GH. 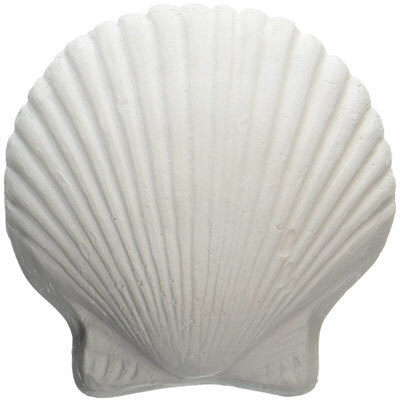 Wonder shells also condition your water, removing chlorine and chloramine from tap water and can help reduce cloudiness as well. They are particularly popular in small beginner aquariums. Just be mindful that it will take some trial and error before you know how many shells you need to reach a specific GH in your tank. 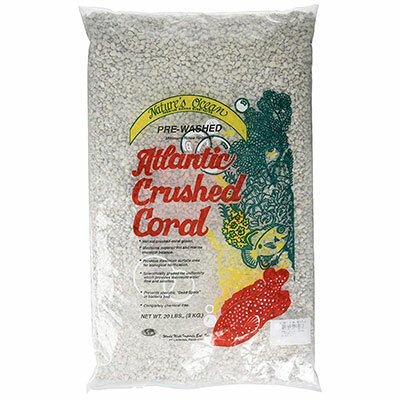 Crushed coral is exactly what it sounds like. Coral that has been harvested from dead reefs. Because coral is largely calcium carbonate, it slowly releases calcium and carbonate into your water when added to your tank. 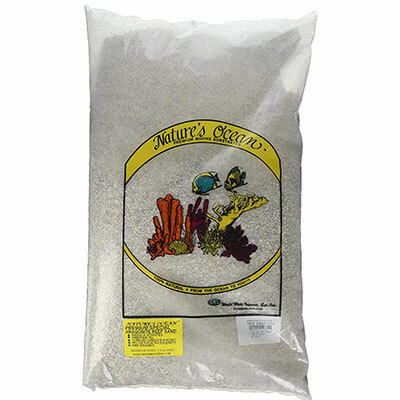 Crushed coral can either be mixed in with your substrate or placed in a media bag and added to your filter. The one thing to be mindful about crushed coral is that it will raise not only your GH but also your KH. The higher KH means that your pH will also be higher. It’s these exact characteristics that make crushed coral a popular choice in cichlid tanks, which prefer hard water with a high pH. Aragonite is available as rocks or sand. 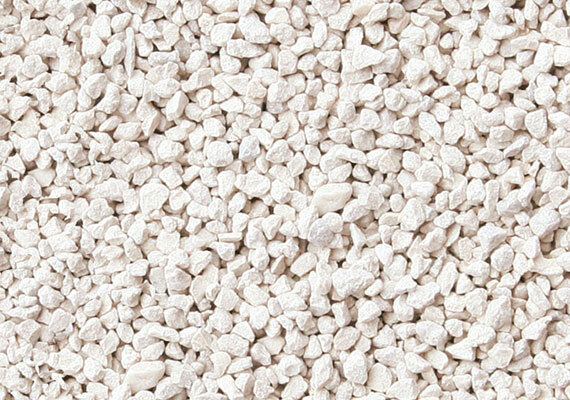 Like crushed coral, it is made up almost entirely of calcium carbonate. When added to your aquarium, it releases both calcium and carbonate into your water. Aragonite is mostly used as a substrate for hardwater-loving fish like African cichlids. It’s more pleasing to the eye than crushed coral. You might also hear aragonite sand referred to as cichlid sand. Just like crushed coral, adding aragonite to your tank will not only increase your GH but your KH and pH too. 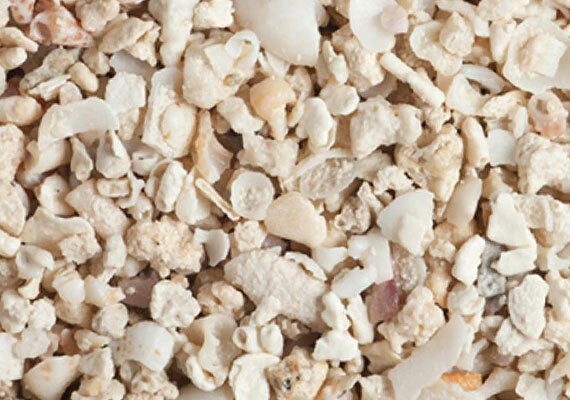 Some brands mix both aragonite and crushed coral together in one product to make it more visually appealing. Okay, so decreasing the GH is slightly more difficult than increasing it. If you have hard water, you may find it easier to keep hardwater fish than plants. Let’s take a closer look at the different ways to lower the GH of your tank. 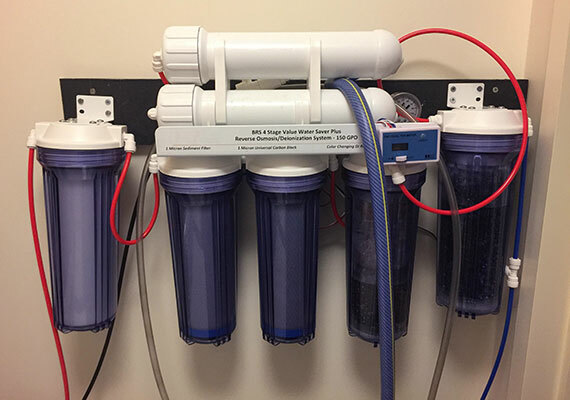 If you need to lower your GH every time you perform a water change, an RO/DI system is your best bet. To put it super simply, this device removes salts, minerals and other contaminants leaving you with 99% pure water. Best of all, this water is soft. So soft, it has a GH of zero. 1. Remineralize – Start from scratch and raise the GH to your desired level using a remineralizer like Seachem Replenish. 2. Dilute – Use the RO/DI water to dilute your tap water, lowering the GH down to your preferred level. While it may be expensive to set up initially, an RO/DI system saves you money in the long run. Distilled water is essentially water that has been turned into steam then collected. When water turns to steam, it leaves behind salts and minerals, resulting in pure water. 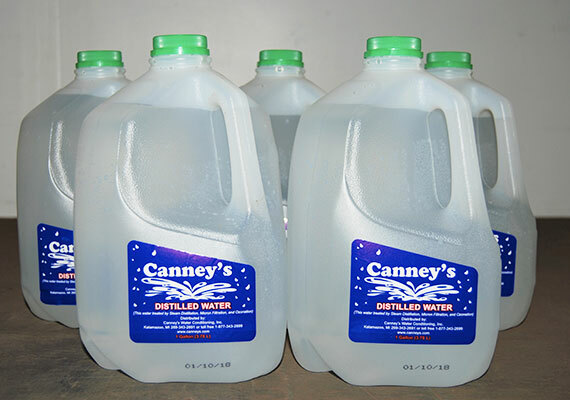 Like RO/DI water, distilled water is soft and has a GH of zero and cannot be used on its own. It must either be remineralized or mixed with your tap water to increase the GH. Peat is dried and chopped up sphagnum moss and, when added to your tank, can be used to soften your water. Simply add peat to a mesh bag and place it inside your filter. As the water passes through the peat, it traps the GH minerals like calcium and magnesium. 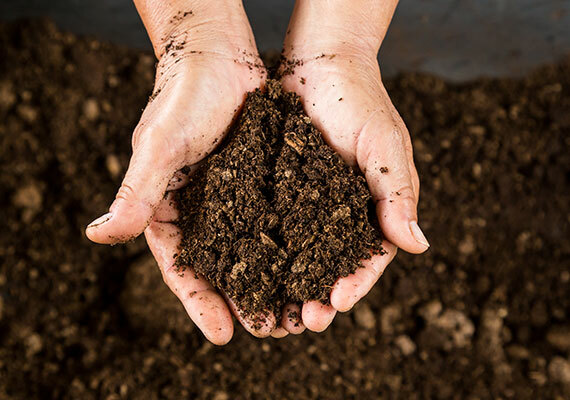 By removing and replacing the peat, you remove these minerals and soften your water. There are some downsides to using peat. Namely, it’s not a very precise method of lowering GH, and its impact can be virtually unnoticeable on hard water with a high GH. Peat also releases tannins, which can lower your KH and pH as well. These tannins also dye your water a yellow color. Depending on what you stock, this may not be desired. Some people use Indian almond leaves to similar effect. 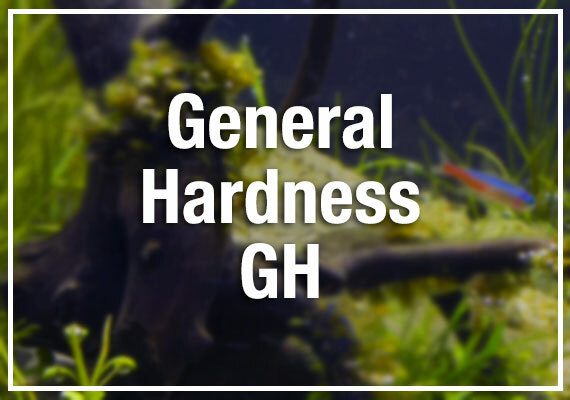 For those with soft or hard water, understanding and adjusting GH is an important part of fishkeeping. While many beginners get by without testing their GH at all, there is a good reason why you should – the health of your fish are at stake! Besides, as you see from this article, testing, raising and lowering the GH of your tank isn’t that difficult anyway. Do you test your tank’s GH levels? Let me know in the comments below! Unfortunately, ponds and the conditions you face are well out of my area of expertise. Do you have a local forum or group of people that do something similar? They would be the best people to go to for advice. Unfortunately there isn’t enough information to go off here to narrow down the cause of your KH spike. If the levels are going up, continuously, then something you are adding or have added to your tank is responsible. Unfortunately, it’s often a case of removing a possible cause piece by piece until you Identify what was responsible. My source of water is a well. It is quite hard with significant iron so I am running an iron filter followed by a water softener using NaCl. I have been using the softened water in my 55 gal freshwater, planted tank. Do these tests for GH detect the Na+ ion from the water softener? What about the KH test? I would guess it depends on the specific indicator. The tap reads about 120 ppm on both, pH 7.5-8. What is your recommendation? I don’t really want to explain to my wife why we need an RO system if I don’t have to. Feel free to be as technical as you want, I can handle anything you can throw at me. Thanks for any help. A KH testshouldn’t pick it up, it’ just detects CaCO3 I’m going off my experience of using API test kits here. A GH test kit will detect CaC03 as well as other minerals, like Na. Test kits are not that good at creating a complete picture. Ideally you want to know the basic composition of your water and then use test kits to look for clues that something is amiss. For those on tap water, there are very few surprises. 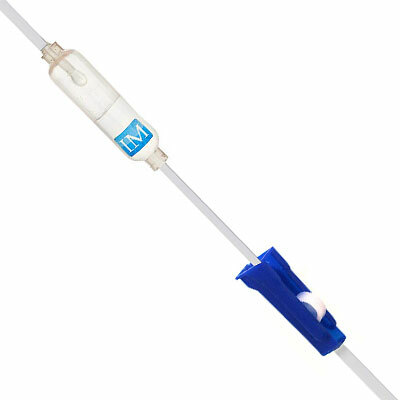 For well water, I would use an ICP-OES test there are pre-made kits available on amazon and at local fish stores. Basically, take a sample of your water and send it away to a Lab. If you do go down this route, I recommend the ATI one. It might be sent over to Germany, but the last time I checked, it had tests that competing labs in America didn’t offer. Unfortunately, I personally do not have any experience with using water softened water. However, given that you are essentially swapping out calcium with sodium, It could be problematic for freshwater fish. Some are more tolerant than others, but ultimately it should mostly be avoided. I test my water every week when doing water changes. My location (also water parameters) and tanks are newly setup. My town tap water comes out like R.O. water with a touch of chlorine. I raise my GH with Seachem’s Equilibrium to 5 dGH and my angel fish and guppies are breeding fine and are healthy. My live plants are all doing good too. My taps KH is also zero and pH is 6.0. I raise both by adding sodium bicarbonate until my pH is 6.8. My KH ends up fine too and my pH doesn’t fluctuate. Just need to find a cheaper alternative to Equilibrium, It goes fast when working with 22 tanks! Wow, 22 tanks? That sounds like quite a fish room. My 4 tanks keep me busy enough and is a compromise with my wife. If I had my way every corner of my home would be filled with them. That’s sure is some soft water you are dealing with. Lucky you have Sodium Bicarbonate, it’s considerably cheaper than Equilibrium! I can’t think of a good solution here short of moving to a new location with harder water. And I shudder to think at the logistics involved in moving 22 tanks. No, lowering the GH will not raise the KH. Something in your tank is responsible for raising the pH of your water, possibly something leaching. I would appreciate your guidance on lowering the pH in my new 40 gallon aquarium. It is at 8.4. I need to transfer my very large common goldfish from a 20 gallon, pH 7.2. I have tried for several weeks with water changes but need to be more aggressive. I have a whole house water softener because I have well water but the pH is still very high. You can add Neutral Regulator or cut your water with distilled water for a near instant fix. Thank you for the advice. I will work on this over the weekend and update you. Not a problem Deborah. I would love to hear your results. good luck! Can you help me out with my aquarium? I can provide advice relative to articles on my site. It’s nothing personal. I no longer provide generalized advice as I was spending over three hours each day replying to comments. I wish it wasn’t the case but between my 9-5 job, my family and my fish, I don’t have that much time. If you need step by step help, I highly recommend joining an online aquarium forum like these ones many experts hang out there and love to provide help! I use RO/DI water in my community tank but I’ve noticed that my GH has gradually risen over time. When I do a water change I set the GH in my RO water using Seachem Equilibrium to my desired level of 8dGH and add that to my tank. Would I be better off testing my tank and adjusting my GH in my RO water accordingly or continue to set it to a predetermined level ? Generally when dosing with additives, it’s best to test the tank and use those results to determine the dose. Blindly adding a preset amount of anything can certainly lead to issues. Lucky for you, this is an easy fix 🙂 Much of fishkeeping is a balancing act! Thank you for your time in putting together such a well written, comprehensive guide. In reviewing this resource I thought that I had seen mention of columnaris but now can not locate it. Can you confirm? Do you mean my identifying and treating columnaris guide? If so, that’s a different article.